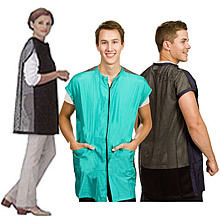 The Stylist Wear 140 Mesh Jacket has a mesh back, protective fabric front with zipper closure, two large pockets, sleeveless. Made of Crinkle Nylon fabric which is soft, lightweight, cool and comfortable. Also is hair and water repellent. The manufacturer has discontinued many sizes, fabric colors and prints. Sizing Help: Stylist Wear Mesh Jackets fit about 1 size larger. Yes, they are generous in size. The measurement examples are below and may vary a tad. The sizes jump up an inch in width and length as the sizing goes up. Sizing measured from left seam to right seam. Chest is measured from just underneath the arm pits. The width in the hips are usually about the same as the chest, maybe 1" larger.